The Flames Rising Design Essay series continues with a little something from David Chandler (Wellington) telling us about his new dark fantasy novel Den of Thieves. 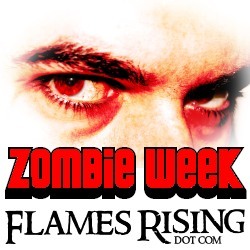 Most Flames Rising readers will know David from his excellent zombie and vampire novels, several of which we’ve reviewed here at the site. In this essay David also shares a little insight into his publishing history and what genres authors are told about they can and can’t write. Hi. My name is Dave. I used to think I was a science fiction writer. That was back in the ‘80s, a wild and wooly time for genre fiction. I was not exclusively a science fiction reader back then—nobody was, or at least, I knew very few people who identified themselves as just “science fiction fans”. When I went to Waldenbooks with whatever money I could scrap together I looked at the wall of books and could spend hours trying to figure out what to buy. There was fantasy, science fiction, and horror, typically all on the same shelf—and I wanted it all. For Cheyenne Clark, there’s a bad moon on the rise. Frostbite is available now at Amazon.com. 12 to Midnight presents its first horror anthology, a twelve author collection centered around their well-established Pinebox, Texas setting. Buried Tales of Pinebox, Texas contains an impressively wide scope of stories (and horrors) while still maintaining certain key threads and locales throughout. There are even repeated nods back to various 12 to Midnight adventures like Skinwalker. It won’t take long for me to talk about the artwork for the anthology. Jeff Varnes cover depicts what must be an image from within the Big Thicket, one of those recurring locales in the book. It’s simplicity makes it work. Any temptation to depict a horror of some sort would have probably stalled. Also, the artwork evokes common and well-ingrained childhood fears of being alone in the woods. Inside, there are two pages of cartography by T.C. Largent. 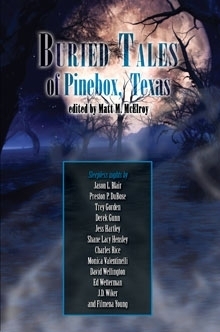 Buried Tales of Pinebox, Texas is available now at Amazon.com and DriveThruHorror.com. Buried Tales of Pinebox, Texas is available at Amazon.com (print) and on the Kindle. There is also an eBook format available at DriveThruHorror.com for $4.99. The latest book in the ongoing saga of vampire hunter Laura Caxton, 23 Hours details the most harrowing and dangerous battle yet. Laura has to not only deal with savage vampires and the violent “half-deads” that serve them…she has to do it with almost no weapons, no back-up and an ever dwindling time-line. While this book does change in scene from the previous books, Laura still gets to hunt vampires while outgunned and lost in the dark. This time she is confined to a maximum security prison that has been overrun by the monsters. She hardly has any weapons and no communication with the outside world. To make things more interesting, she made “friends” with some very nasty inmates early on the story…naturally, they are on the loose as well during the battle and they don’t want to make things any easier for Laura or her allies. The Buried Tales anthology of horror and supernatural fiction transports you to the rural town of Pinebox, Texas, where secrets are buried but the dead don’t always stay that way. Buried Tales includes stories by Jason Blair, Preston DuBose, Trey Gorden, Derek Gunn, Jess Hartley, Shane Lacy Hensley, Charles Rice, Monica Valentinelli, David Wellington, Ed Wetterman, J.D. Wiker and Filamena Young. Stop by the Buried Tales website to check out author bios and audio previews. Pre-order the book today at Paizo.com or the Midnight Cellar. David Wellington is the author of several successful horror novels, short stories and web serials. The Monster Island zombie series and 13 Bullets vampire fiction are very popular with horror fans, who can’t wait to see what happens next. Vampire Zero, the third book featuring Laura Caxton and Jameson Arkeley was recently released. I had the chance to talk to David a bit about the story and some of his other projects. The author of 13 Bullets and 99 Coffins, David Wellington takes the Laura Caxton series to a whole new level in this action-packed third volume. Vampire Zero: A Gruesome Vampire Tale is available at Amazon.com. Skin and Bones is the second installment in Permuted Press‘ series of zombie anthologies, The Undead. It’s very much a case of what you see is what you get–which, of course, isn’t necessarily a bad thing, providing you like zombies. The anthology opens with one of the strongest tales, David Wellington’s Cyclopean. The over-used ‘zombies working 9 to 5, no one even realizes they’re zombies’ theme is employed, but only lightly. Cyclopean is a fast-paced, entertaining and original zombie tale with Lovecraftian overtones. After having read Monster Island, I was pleased to hear that Wellington was writing a vampire story. 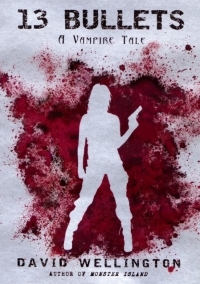 13 Bullets is a modern action adventure with deadly vampires, great writing and a few clever plot twists. The vampires in 13 Bullets are as inhuman as they get. Usually sometime after they’ve been turned they begin to lose all of their hair and mutate into their new, monstrous forms. They are incredibly strong, difficult to damage and often have an array of other powers at their disposal.